Right off the bat Fred and I started sharing tips and tricks with the camera. He’s had his for over a year now, so I took advantage of his experience to learn about the various focusing modes and other goodies on the camera. This thing has lots more to worry about that my old D50, and I’m still learning. The problem with visiting a spot like this multiple times is that you tend to take the same shot over and over. The challenge is to find some new angle, some new vantage point that hasn’t been covered be every other camera in Greenville. I knew I’d take some of the same shots today, but my goal was to see what new images I could create. Fred and I started out by crossing the Liberty Bridge. We took a couple of the traditional shots of the falls. From there we wandered under the bridge and joined the throngs of photographers there. I tried to catch some wide angle shots that included both the bridge, sky and falls. It was impossible to get a shot without tons of people in it. We wandered to the other side of the park and took a couple of obligatory shots of the tree with exposed roots right below the Governor’s School campus. I pulled out my little Lumix because it has a wider angle lens so that I could capture the yellow crown of the tree in addition to the roots. I suggested to Fred that we climb to the top of the Springs Street parking garage. 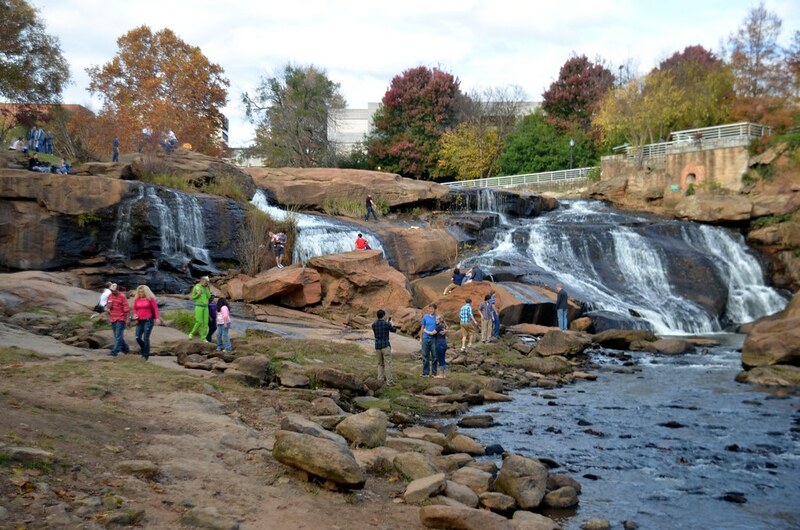 The top of the garage affords sweeping views of the entire Reedy River area, including Falls Park, Main Street, Greenville Skyline, and Liberty Bridge. The angle obscures the falls themselves, and the other vistas are well worth the climb. From the parking garage we crossed the Reedy over to River Place and took some shots of the river upstream and across the river. Truth be told, I like the colors in the Lumix image better. We took a couple more photos of the light coming through the yellow tree at the top of one of the fountains, as well as several of the lingering colors of in the trees. Boggs Street is a small alley that runs parallel to Main Street. I like it as a photographic venue because it is off the beaten path, and there are often interesting textures. Fred and I headed in that direction. We did catch a couple of interesting shots. However, even here we were not alone. Another photographer and model had scoped out the alley as a venue. Fred and I made our way back to Main Street, next to the Army Navy Store. Wandering back to our starting point, Fred and I parted ways. This was MUCH better than the last photo walk I went on with the Upstate Photography group. That group had so many competing egos that was not as pleasant as it might have been. Fred and I got along great, and we learned from each other about our cameras. It was an excellent photo walk, and we decided that this needs to be a regular outing with others of our Flickr friends. I’d say y’all hit the mother lode with this walk. You have one of the leaves that looks like one of those Fauve paintings, or maybe verging on expressionist. I’m thinking of some of the Matisse paintings. Loved the color you got in that Lumix shot of the PCA, but the shots downstream of the dam and up toward river street were quite pleasing. Nice work. What glass were you shooting with? I was using a Sigma 18-200 lens.